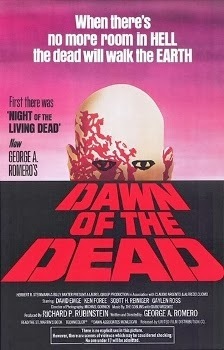 Dawn of the Dead was released on May 24th, 1979. 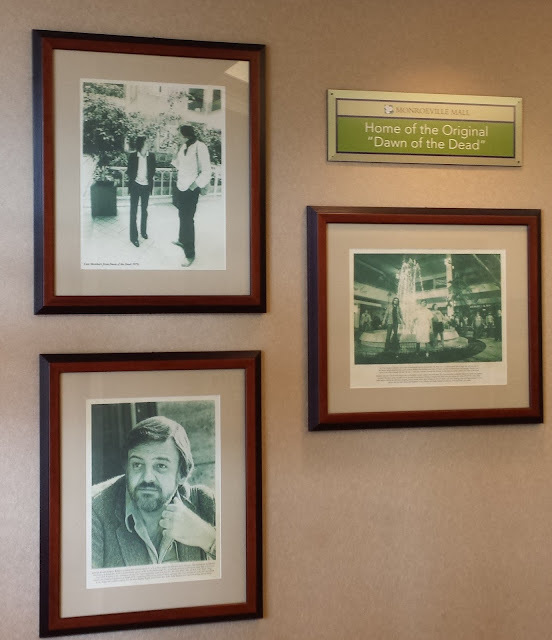 Filming locations include Monroeville and Pittsburgh, PA.
Plaque and pictures in one of the hallways on the Macy's side. Awesome, thanks for capturing and posting this! The first picture (with the 1970's orange shag carpeting used as soundproofing), is in the audio production studio of WPGH-TV 53, at 750 Ivory Ave. in the North Hills section of Pittsburgh. The first 4 minutes of the movie were shot in the production control rooms and studio, on a weekend. I was a engineer at WPGH in 1978 and 1979 on the weekend shift, at the time of filming, and was tasked, standing just out of camera range, with keeping the talent from pushing the wrong buttons. There is a ringer in these scenes; Dan, a commercial producer at the station, took over operating the Chiron II character generator keyboard to produce the graphics, because it would have taken too long to train an actor to do it, and got a line and credit in the movie. That's some really cool inside info, thanks for sharing Sid! Sid-that's good stuff.Another location is in North Huntingdon where Elk Air Conditioning is now,(where the tractor trailer trucks are leaving) AdamtheWoo points it out on one of his trips. Where was the trucking terminal location?